Aaron Elster was 7 years old when the bombs came, thunderous airplanes whooshing over the Sokolow Ghetto in Poland, bringing destruction in their path. Three years later, he stood against a wall with his family—his parents, an older sister and his 6-year-old sister Sarah—waiting to be sent to nearby Treblinka, one of the Holocaust’s extermination camps, as the German army came to liquidate the ghetto, but he escaped, crawling to the edge of the ghetto, crossing the barbed wire border, and running for his life. He never saw most of his family again. Elster’s sister also escaped, connecting with a Polish farmwife who hid her on the property, then he was able to locate her and, after he had spent some time hiding outside in other local farms and stealing food, the bitter cold arrived, and he joined his sister there, then for the next two years, Elster lived in the attic of that farmwife’s house. He never left the attic during that time, surviving on soup and a slice of bread once a day. He couldn’t bathe or brush his teeth, had no new clothes to change into and wasn’t allowed to make any noise. Covered in lice, he spent his days delousing himself in silence until the war ended, at which point he was transferred to a Polish orphanage. He and his sister were eventually smuggled out of Poland and headed to the United States. Now, Elster tells his story from the safety of the Illinois Holocaust Museum and Education Center’s new Take A Stand Center in Skokie, Illinois—but he does so as a hologram. The Center is broken into three parts. 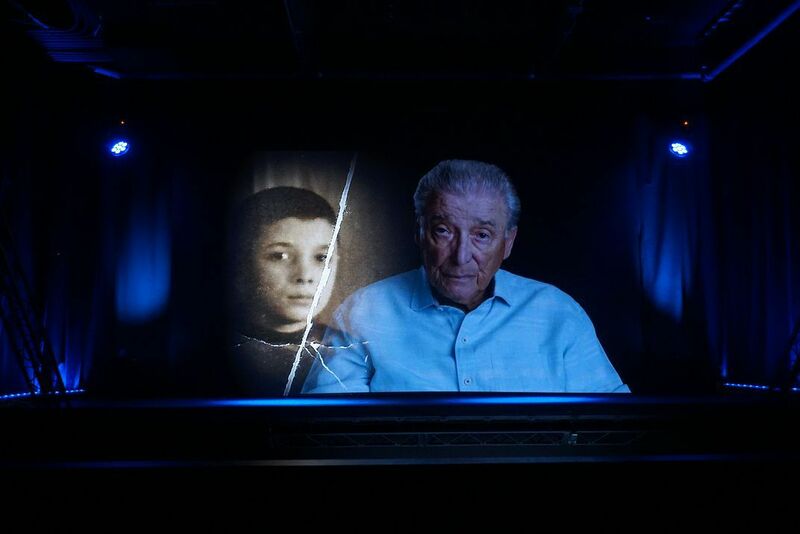 Guests start in the Abe and Ida Cooper Survivor Stories Experience theater, where first-in-the-world technology allows visitors to interact with holograms of 13 Holocaust survivors, seven of which live in the Chicago area, including Elster. The survivors were filmed in 360 video with more than 100 cameras, a process that took about six days—all day—per survivor. After a roughly half-hour hologram experience, guests move into the next part of the exhibit, the Upstander Gallery. Here, 40 people are featured as “upstanders,” those who are working hard to stand up for human rights and make the world a better place as a result. 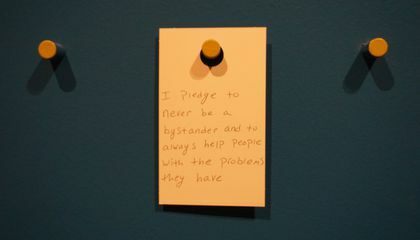 From there, guests move on to the Take a Stand Lab, a hands-on tool that helps anyone become an upstander themselves. The interactive Lab shows people different ways to take action, and then sends them home with a kit on how to actually do it. Jennifer Billock tells an essential story through this piece. Illinois Holocaust Museum's interactive, holographic storytellers, Aaron Elster, Sam Harris and eleven others, provide a living reminder of both the ultimate horror and kindness capable in human beings. After learning about the survivor's lives and connecting with their hologram, guests move on to the Take A Stand Lab, where they learn how to become "upstanders" themselves. As global citizens and members of the human race, it is our civic responsibility to protect the rights of our peers. Knowing human history-- our history-- both guides and provokes us to construct our values and honor them without fault. Illinois Holocaust Museum's holographic interactions preserve the knowledge and history of people who's basic human rights were undeniably and horribly denied. With them, we can learn, mourn, and strive for a brighter future. A Holocaust Museum in Illinois has created hologram technology that allows Holocaust survivor's stories to be recorded and their responses to people's questions answered. The visitors to the museum then get to see activists fighting to make a change, and then they enter a lab where they are given resources to incite their own change. The survivors are hopeful that this new technology will promote "up-standers", people who will fight to make a change and actively try to educate and better the world. This story connects to our topic of civic engagement by demonstrating the attempts in society today of becoming active in society and participating in making changes in the way we view the Holocaust and war. The survivors and the layout of the Museum will influence visitors to contribute their ideas and support to causes that will greatly benefit, educate, and protect society, all key components in civic engagement. This is a very touching article about people sharing their memories of the holocaust. One man honored at the museum is named Elster. Through a holographic video, Elster among several others talk about their time in the Holocaust and how they survived. Their stories have been preserved in the museum to teach others about the horror they experience. The museum even has and interactive Lab that "shows people different ways to take action, and then sends them home with a kit on how to actually do it." That is the optimal civic engagement. It offers an opportunity for people to take action and actually do something to help the cause.